The World Chocolate Masters are the most prestigious global event for chocolatiers and patissiers. Every second year they bring together the very best competitors for three intense days of competition in Paris. This year the Australian qualifying rounds for the World Chocolate Masters were held at the Foodservice Australia show. Visitors were able to watch as competitors created their sculptures over eight gruelling hours to the theme of 'Inspiration from Nature'. 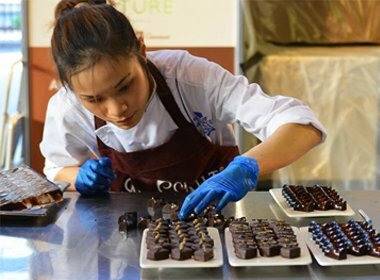 Three master chocolatiers, including Elicia Chan from Le Cordon Bleu in Sydney, Sassi Matteo from Sydney’s Choco Bean Catering and Rebecca Carins from Savour Chocolate & Patisserie School in Melbourne, competed for the opportunity to represent Australia at the World Chocolate Masters next year in Paris. Over the 8 hours each chocolatier was asked to produce two types of bon bons, two entremets and a chocolate showpiece up to 1.8 meters high. With an amazing design, the winner this year was Rebecca Carins from Savour Chocolate & Patisserie School, however we congratulate Elicia on a stellar effort with her design. Elicia has now been invited to Taiwan to support the Australian representative at the Asian regional qualifier who competes to represent Asia for the Paris Final in two years.